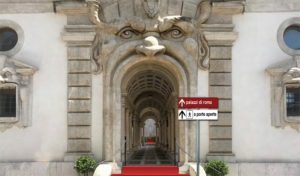 This month, Turismo Culturale Italiano is inviting visitors into 73 of palaces in Rome for guided tours during its sixth annual Porte Aperte event. Many of these residential palaces, built between the Renaissance and the 20th century, are privately owned and not usually open to the public, so this is an exclusive chance to visit these elegant and historic buildings. Inside, visitors will discover art and architecture from the 15th to the 20th centuries, including Renaissance, Baroque, Neoclassical, Rococo, and Eclectic styles. Artists whose work is displayed include Renaissance masters such as Caravaggio, Bernini and Raphael. Together, the palaces tell the story of Rome’s artistic and architectural history. While most of the palaces are in Rome, some are outside the city, and Turismo Culturale Italiano is also taking visitors to terraces overlooking the city and on day trips beyond the city limits. Guided tours are offered at different palaces on different days and times; view the schedule on the event’s website at www.turismoculturale.org/porteaperte.htm. Prices range from 4 to 32 euros per person for guided tours. Visitors must call +39 064 5421063 to make reservations at least 24 hours before the tour.